The tool we think of as pliers only evolved from “tongs” fairly recently, but it’s hard to imagine life without a variety of them in the old toolbox. For electrical work, you need lineman’s pliers. These have insulated handles and shallow serrations on the jaws to grip sheet metal and twist wires, as well as a handy built-in wire cutter. For plumbing, you’ll want a pair of water-pump pliers, designed for gripping pipes and angled to get into tight spots. The double-lever action of locking pliers exerts a tremendous amount of force to clamp things together while you work. It’s also a good idea to have a pair of slip-joint pliers handy. They’re not that precise, but their adjustable jaw width allows a lot of versatility for jobs you just can’t do with your bare hands. 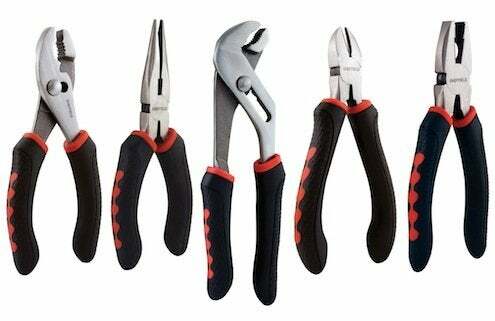 If it’s precision you need, you want needlenose pliers, which look just like they sound.